The main reason for my visit to Uruguay was to attend the First International Workshop on New Metrics for Evaluation: Towards Innovation in Learning. This event was organised by the Centre for Research at the Ceibal Foundation in collaboration with INEEd, the ICT4V centre and the education division of the Inter-American Development Bank. 1. 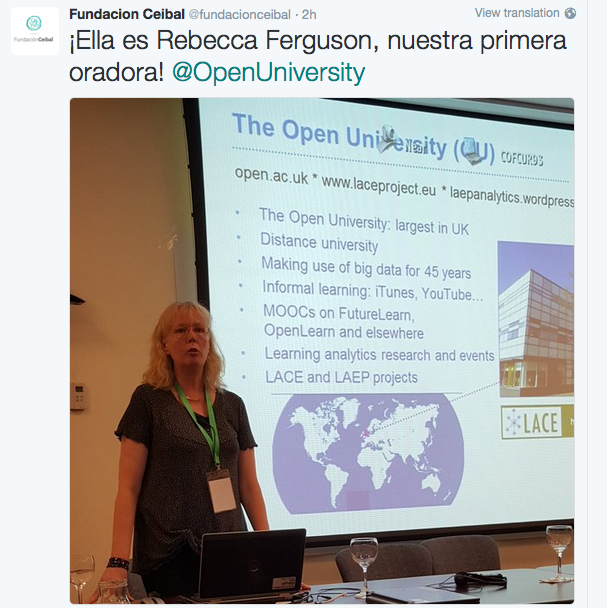 Using data for research and evaluation: towards an open and collaborative process for analysis, research and improving education. 2. Presenting experiences in the use of information systems for improving learning outcomes. 3. Presenting innovative approaches for evaluation and assessment of learning outcomes. 4. Policies, projects and programs for technology integration and data use in education. It was a fascinating event, with representatives from countries across South and Central America, including speakers from Brazil, Chile, Colombia, Ecuador, Mexico, Nicaragua and Uruguay. Other speakers from outside the continent were Dragan Gasevic from Edinburgh, Neil Selwyn from Monash in Australia and Gilles Dowek from France. I was particularly interested to find that Uruguay runs a ‘One Laptop per Child’ programme based on premises of equality and justice. Uruguay sees access to computers and the Internet as a right. You should have them in your classroom, just as you should have electricity in your classroom. Plan Ceibal has supplied 600,000 people (a fifth of the population) with laptops or tablets. Every child gets one when they start school, and they get a replacement every three years, with secondary school children now receiving Chromebooks. Internet is available nationwide – no one should be more than 400 metres from the Internet. There is a maintenance programme and a disposal programme, a teacher training programme, a learning management system, a suite of software, and a programme of video-conferenced English lessons, arranged in conjunction with the British Council. What are the potential gains, and what are the potential losses? In whose interests is this working? Who benefits, and in what ways? What are the social problems that data is being presented as a solution to? How responsive to a ‘data fix’ are these problems likely to be? These wider questions of politics and power have not yet been taken up to any extent by the learning analytics community, but they look set to be bigger issues as the field matures. 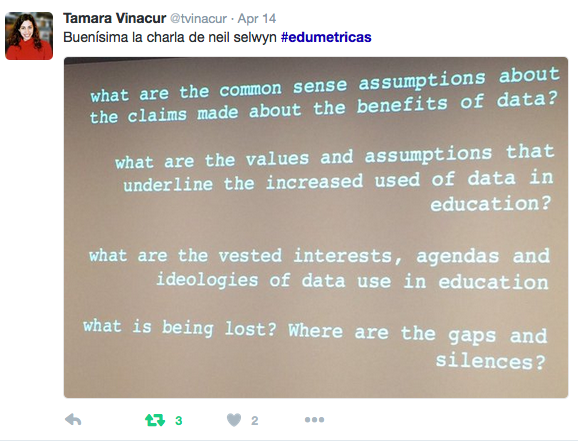 My talk was on learning analytics, the state of the art and what the future might look like. I also took part in a round-table discussion with Neil, Gilles and Dragan on issues related to learning analytics. This entry was posted on April 24, 2016, 9:19 pm and is filed under Analytics, Educational Futures, Esteem, Events, Presentations. You can follow any responses to this entry through RSS 2.0. You can leave a response, or trackback from your own site.